Recently I had the opportunity to talk with Karen Tate on her show, Voices of the Sacred Feminine, which was the last show of 2011 (Dec 28). We had a great discussion about the concept of my recent work: Egypt, 'magical' thinking, and words of power. By the end of our time together, the talk turned to the question of now that we are entering the year 2012, what does that mean? I am not sure that I answered as completely as I would have wanted. So I want to continue that conversation here. I believe that the most important thing to know about 2012 is what with all of the internet articles and books written on the Mayan prediction that time ends on 12-21-12, and what with all of the speculation about whether the event will spell disaster; or if not, what it will mean? With the majority of people musing about the subject, our thoughts about the subject have already raised the conscious awareness of most people. We believe that something is afoot. A change, a transformation is about to take place, and many people are poised for that to happen. Whether they are aware of it or not, their thoughts are spring loaded and waiting for whatever event will jettison us into the transformative cauldron. It could be a physical, planetary change, or something more sutle like a spiritual vibration that attunes us to deeper information and understnding. The Law of Vibration suggests that like attacts like, and so with global consciousness and multiple energies poised for a transformative experience of some kind, one will occur. The question is which one? Are there more doomsayers who see mass destruction and environmental degradation, or are there more of us wanting to pool our resources and work with healing energies in love and cooperation? Which kind of life do you want to wake up to after 2012? One grasping for the last resource in your neighbor's hand, or one that joins hands to work toward a common goal? Mine is the later, and it is my task--and I hope it will also be yours--to envision that peace and communion every day. I intend to set aside each full moon for meditation on how I can best serve others and align with the divine plan. When the ball drops us into the coming year, it is my fondest dream that a wave of peace and fellowship of man will surge across us all. And it is my deepest desire that all of our 2012 transformations be made for the benefit of the planet and all sentinent beings in the spirit of abundant life and love. May we live enlightened and shepherd in the Great Light of the Divine. To hear my interview with Karen go to her webpage and search for the program dated Dec 28, 2011. Regardless of the degree of initiation, spiritual celebrations and communion still have a profound psychic effect on the individual. The mysteries always call upon us to turn inward and to face the unknown with strength. There was an outer ceremony for nearly every Egyptian, but there was an inner articulation of the mystery for only a few. That’s not surprising. Religion is probably the most misunderstood concept of all—primarily because religion is a subcategory of a larger concept, which is spirituality and unity with the divine. The ancient Greek philosopher Herodotus recalls a solstice ceremony in which a bull, a symbol of Osiris called “The Good Being," was sacrificed and its carcass stuffed with flour cakes, honey, raisins, figs, incense, myrrh, and other herbs. 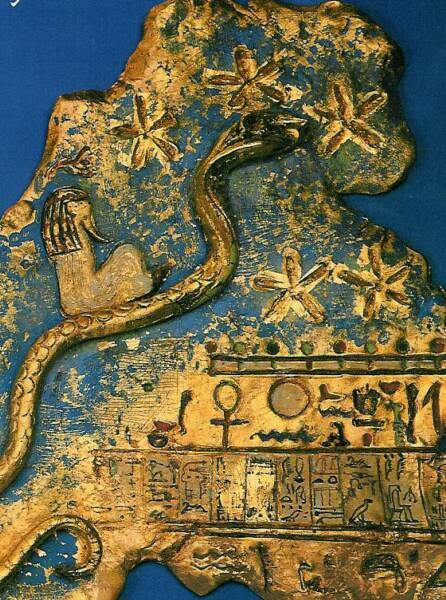 It roasted over a fire as the priests of Osiris poured oil over it and upon the flames to keep the fire going. Afterward, they ate the ox. The ritually sacred body and fluid of the bull of Osiris has become the bread and wine given for all. Anglicans and Catholics might find a resonance with the Eucharistic sacrifice of Christ. The seed is the container of the mystery. Knowing the God has died, the God is risen, and the God shall come again is the essence of the mystery tradition. In death initiations one contacts the sorrowful mysteries, but the joyful mysteries lie beneath them. The sarcophagus in which the body is placed bears upon its coffin lid the image of the sky goddess bending over the dead. Literally, the word sarcophagus means "sacred eating." At the end of the day, the goddess ingests the sun and it travels through her dark body in the same way that the soul of light is swallowed by death and returned to its source. There, in the dark and stillness, one gestates a new life. The tomb is the womb of the goddess—an entrance and exit. In the words of the hierophant Hermes Tresmigestus, the 'There where everything ends, all begins eternally." Such was the way of mystery initiations performed under the veil of night. Moving beyond the dark night of the soul, one may burst forth into ecstatic states of poetry, illumination, and wisdom. It is the darkness that provides new meaning to the light. 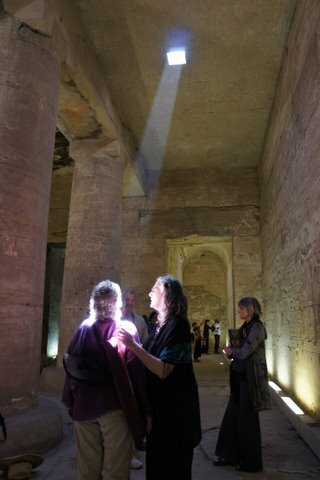 To spend the darkest night of the year inside the temple of the Goddess, in the sanctuary that represents her body, and to rise renewed at dawn the following day may facilitate all manner of psychological and spiritual transformations that leads one to die to the old life and embrace each day anew. If you are interested in attending an all-day Saturday event in which we “Lighten the Dark” through journal practice, please email me: ellisisis@aol.com with Jan 8 Journal Event as the subject line. I’ll send you price and information.